The Omni LTL Package is a totally integrated software system designed specifically for the LTL Trucking Industry. The system allows for terminal pick up and delivery, interline, delivered to dock, and both inbound/outbound manifesting for bulk facilities. In addition, standard truckload dispatch can be utilized for backhauls or consolidated loads. Drivers and Owner Operators can be paid percentage, mileage, hourly or flat rates. The dispatcher can perform dispatch duties while allowing immediate access to pertinent operational information. The screen contains current trip information, pre-plan load information, hours of service, driver dispatch history for the last 30 days and advances received by the driver. Records driver check calls and maintains ongoing status on loads for future inquiry. The ability to view all information relevant to a driver in one screen provides dispatch with information quickly thereby decreasing the time to make decisions and keep loads moving. This means fewer lost opportunities, less empty miles, as well as faster and more effective decisions, ultimately delivering you a faster path to profit and productivity. Creates both inbound and outbound manifests. The Omni system is a true LTL package. You have the ability to create inbound manifests as well as outbound manifest. A standard truckload package that says they offer LTL capabilities normally will only offer outbound manifesting. In addition, you can have up to 9 dispatches on a manifest. Instead of forcing you to change the way you do business to fit into a standard truckload package, Omni's LTL package was designed for LTL operations ensuring you receive full utility from the system and consequently full return from your purchase. Set up trailer drop yards easily as you dispatch. If dispatch is required to drop a trailer for a new customer, the dispatcher can create the trailer yard without setting up a defined yard prior to arrival or dispatch. Every trailer is either behind a truck or on a defined yard, you cannot lose track of equipment . Multiple split screens for matching loads to equipment. The Load Matching screen allows for complete planning and assignment of equipment to loads by displaying available and preplanned loads with available, preplanned and inbound equipment by state, area, ETA or pick up date. Click the load, click the tractor then click the Preplan button! This screen insures better decision making for preplanned and backhaul loads with equipment. The Fleet Control screen displays all tractors/trailers by state, region or multiple regions showing current load status, ETA and preplanned load for the next dispatch. This screen is a tool management can use to view the entire fleet and recognize any problem areas that need to be addressed. Ensuring trucks have preplan or backhaul dispatches thus increasing revenues and decreasing deadhead. Automatic check call will be created from fuel card purchases that are imported from your vendor and displayed for dispatch with location of purchase. The downloaded fuel purchases from your fuel vendor (i.e. Comdata) will automatically record tractor locations as check calls. If your company does not have a communication system, you can still have some of the benefits without the cost. The dispatcher can view tractor locations in relation to delivery information at any time. Send dispatch information to Driver's cell phone. 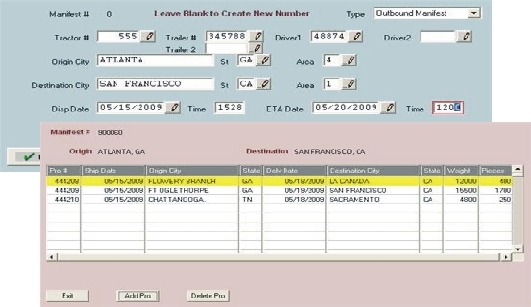 Omni has the feature to send dispatch information using preformatted forms or any messages from your dispatch screen to your driver's cell phones. The Omni System stores the driver cell phone number making it easy and convenient to send the information with just one click. There are no limits on the number of drivers. Providing an economical way to utilize current technology. Send dispatch information to driver's cell phone without purchasing third party software. Use the Omni email functions to email reports and images created by Omni directly to a third party. Email invoices to customers and settlements to drivers.